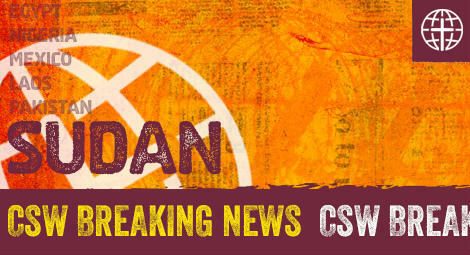 Christian Solidarity Worldwide (CSW) can confirm that Czech Christian Petr Jašek is being tried jointly with Reverend Hassan Abduraheem, Reverend Kuwa Shamal and Mr Abdulmonem Abdumawla in Sudan. Mr Jašek is charged with the propagation of false news (Article 66 of the Sudanese Criminal Code). He is also accused, along with Reverend Hassan Abduraheem Reverend Kuwa Shamal and Mr Abdulmonem Abdumawla, of at least seven crimes, including waging war against the state (Article 51 of the Sudanese Criminal Code) and espionage (Article 53), which carry the death penalty as the maximum sentence. As with Reverend Abduraheem and Mr Abdumawla, the case against Mr Jašek centres on the provision of finances for the medical treatment of Mr Ali Omer, a young man from Darfur who was injured in a demonstration in 2013. Mr Jašek heard of Mr Omer’s plight during an international conference for Christian leaders in November 2015. Reverend Abduraheem and Reverend Shamal were also attending the conference, where Reverend Abduraheem had been invited to speak about his work as a church leader in Sudan. During his presentation, Reverend Abduraheem showed a picture of Mr Omer and mentioned that he had donated money towards his medical treatment. Mr Jašek subsequently pledged to provide finances for Mr Omer’s treatment. In December 2015, Mr Jašek travelled to Khartoum and met Mr Omer. The meeting was facilitated by Reverend Abduraheem and Mr Abdumawla, who is a friend of Mr Omer’s and had been collecting finances for his medical treatment. Mr Jašek donated $5,000 towards Mr Omer’s medical treatment, which was signed for by Reverend Abduraheem and Mr Abdumawla. As he was leaving Sudan, Mr Jašek was searched at Khartoum Airport by NISS agents who found the receipt for $5,000, signed by Reverend Abduraheem and Mr Abdumawla, and arrested him. They also confiscated personal belongings, including his mobile phone, laptop and camera. Nine days after Mr Jašek’s arrest, Reverend Abduraheem, Reverend Shamal and Mr Abdumawla were also arrested by NISS officers. While Mr Jašek, Reverend Abduraheem and Mr Abdumawla remained in NISS detention, Reverend Shamal was conditionally released until May 2016, when he was re-arrested and held in the Attorney General’s custody. Mr Jašek, Reverend Abduraheem and Mr Abdumawla were also transferred to the Attorney General’s custody in May 2016. They were all charged in August 2016 and their trial is ongoing. The prosecution alleges that the $5,000 Mr Jašek donated to Mr Omer’s treatment was in reality support for rebel movements in the South Kordofan, Blue Nile and Darfur regions. By framing the case in this manner, NISS has attempted to exploit the fact that Reverends Abduraheem and Shamal are originally from the Nuba Mountains in South Kordofan and Mr Abdumawla is from Darfur. Reverend Shamal was not involved in fundraising for Mr Omer’s medical treatment but appears to have been included in the case due to his senior position in the Sudan Church of Christ, his relationship with Reverend Abduraheem and his ethnicity.